This article was originally written in Spanish. 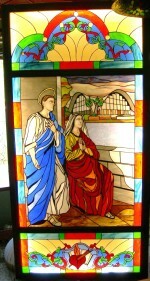 Galería Vitral is a stained glass studio and supplier in Santo Domingo, Dominican Republic. We started in 1991, and in our early years we were the only stained glass studio in our city that took commissions: Tiffany style lamps, stained glass panels, small accessories, and so on. These works were made solely by the owner. Later, as the business began to grow, we sought help from other craftsmen to meet our work commitments. 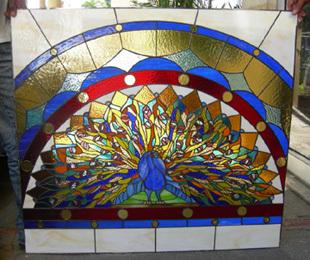 By 1998 the art of stained glass had become increasingly popular in our country, and we saw the need to supply materials for making stained glass. Since then, while continuing to take commissions, we have become a supplier for all the materials needed to produce these works. Additionally, we offer courses on designing stained glass using Glass Eye 2000, which has been an excellent aid for the improvement and enhancement of our designs and artworks. Before using Glass Eye 2000, we spent hours standing in huge sheets of drawing paper, making additions and making copies. After learning Glass Eye 2000, everything was extremely easy, fast and accurate. Our way of working became more comfortable and designing became fun, creative and rewarding. Using this software we were able to create large-scale works for churches, residences and commercial properties. The peacock design was inspired by an image that the client saw in a magazine and asked us to adapt for his stairwell. This client had previously commissioned us to make other windows. As in those previous works, he wanted lots of glass color because it would be installed in a window that gave a lot of light, and he loved bright colors and the tropical look. Our earlier work for him also contained birds and flowers. The peacock window came with two smaller windows below it, and we chose colors to harmonize with (but not compete with) the colors of the peacock. Other works we have done include the Cathedral of Bani, the Cathedral of San Juan de la Maguana, the Church of St. Augustine in La Vega, the San Juan Bautista Church in Santo Domingo ... and many more. We continue to love and enjoy this beautiful art as well as supplying customers with materials and instruction. We have integrated line molten glass materials among our products. The art of stained glass is beautiful but laborious, so when we have useful tools such as Glass Eye 2000 we can only say: thank you for helping to simplify our lives! Miguelina Abreu studied Civil Engineering and graduated in 1981 from Universidad Catolica Madre y Maestra of the Dominican Republic. 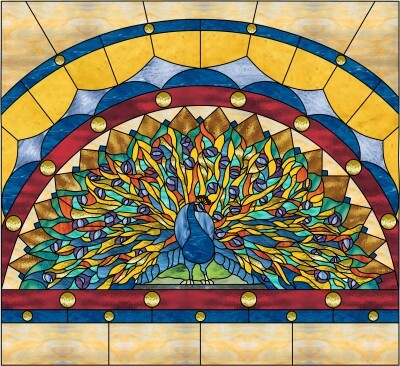 She worked as an engineer until 1991, when she was introduced to the art of stained glass, learned the techniques, and devoted herself fully to it. Miguelina can be reached by email.